Remove the stems of the berries and slice each in half. 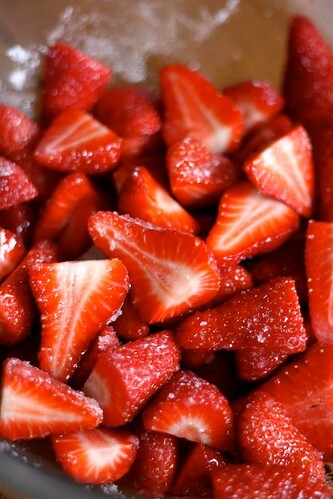 Place in a large bowl and toss with sugar and salt. Let macerate for an hour. Drain the liquid the berries produce into a small sauce pan reserving the fruit in the bowl. Add the glucose and a 1/2 cup water to the sauce pan with the berry juice. Bring to a boil and add the shiso. Boil for one minute and then take off heat. Let the shiso infuse for 5-10 minutes. Pour the liquid, with the shiso, over the berries. Transfer to a blender and puree the berries with the shiso liquid. 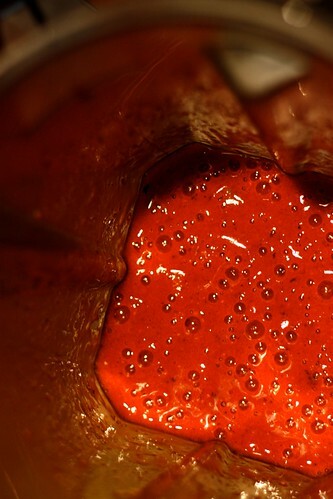 Strain through a fine-meshed strainer and refrigerate for at least 2 hours and up to a day. Process in an ice-cream maker according to manufacturers’ instructions. This entry was posted on April 18, 2010 at 4:37 pm and is filed under Dessert, Recipe. You can follow any responses to this entry through the RSS 2.0 feed. You can leave a response, or trackback from your own site. Exquisite! Does that taste as good as it looks? Beautiful! I love the combination of Shiso and strawberry. 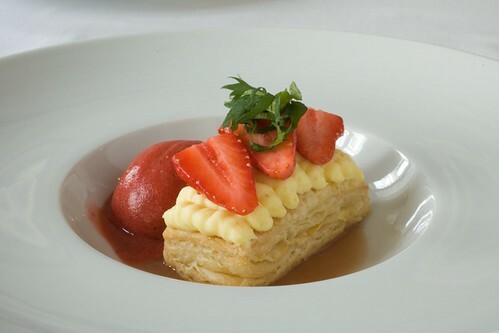 And combined with the puff pastry…yum! I will have to try this very soon!